CHELSEA space is delighted to present the first solo London exhibition by Canadian artist Ian Carr-Harris. Carr-Harris (b.1941) is a Toronto-based artist whose work has been exhibited internationally since 1971. Exhibitions include the Venice Biennale (1984); Documenta, Kassel (1987); Sydney Biennale (1990) and The Power Plant, Toronto (solo, 2002). He is the Head of Sculpture and Installation at the Ontario College of Art and Design, Toronto. This is a rare and long-overdue opportunity to see the work of one of Canada's most respected artists in Britain. Carr-Harris is exhibiting a number of works spanning from 1993 to date, highlighting different aspects of his career from the past twelve years. 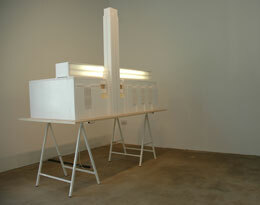 This includes seminal works such as the large cabinet piece Made in Hong Kong (1993) to a new work from the series Paradigm, using hand-made, scaled-down models of international museums with an intricate internal lighting system, in this case Tate Modern. Utilizing diverse media, Carr-Harris's work is characterised by a fascination with the ways in which desire and subjectivity are negotiated within language and social conventions. "My work centres on acts of re-tracing... Events rather than objects, they require that we look at something that we already "know", and in that looking to discover - not quickly, not entirely grasped - something we took for granted." (Ian Carr-Harris, quoted in catalogue for Ian Carr-Harris: Works 1992 - 2002, The Power Plant, Toronto, 2002). 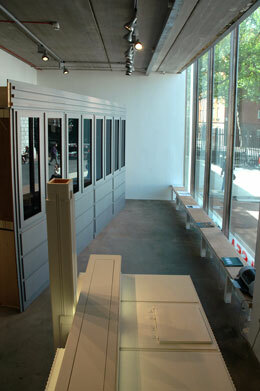 CHELSEA space is set within Chelsea College of Art and Design's new campus at Millbank, next to Tate Britain. Open to the public, the intention is to create a research development centre for invited art and design professionals, providing an exhibiting space, library research facilities, and a platform to develop projects that may otherwise remain unrealized. Ian Carr-Harris in conversation with Sotiris Kyriacou, Director of Program. Internationally acclaimed architect Will Alsop, who designed the Ontario College of Art and Design, talks about his work including his forthcoming project for Chelsea College and Camberwell College of Arts in Peckham Square, next to his award winning Peckham Library.